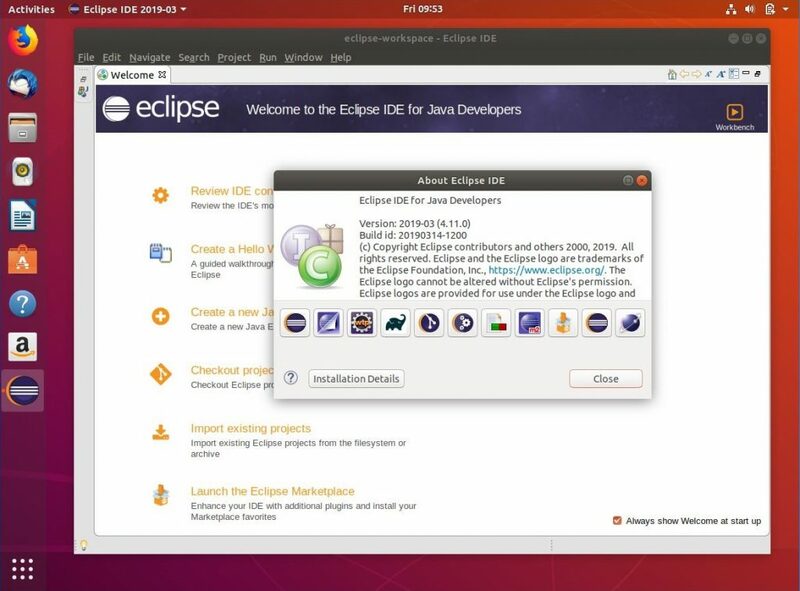 Eclipse is a popular, well-known Integrated Development Environment for application development. It is the most widely used Java IDE and is written in C and Java, released under Eclipse Public License. Eclipse is not only used for developing applications in various programming languages including COBOL, Ada, C, C++, Perl, PHP, Python, R, Ruby (including Ruby on Rails framework), Clojure, Scala, Groovy, and Scheme. With the support of plugins available in Eclipse Marketplace, you can extend the functionality of Eclipse. In this tutorial we will learn how to install the latest edition of Eclipse IDE in Ubuntu 18.04/18.10 and Linux Mint 19. Eclipse requires Java JDK / JRE 8 or above to be available on your machine. Install OpenJDK. Verify the Java version on your machine. Install the wget package on your system to download the Eclipse IDE package from the internet over a terminal. ownload the latest version of Eclipse IDE 2019-03 from the official page using a web browser or download the Eclipse IDE 2019-03 package over a terminal using the following command. Extract the downloaded Eclipse IDE package to your desired directory (Ex. /opt/). Create a link to the eclipse executable to /usr/bin path so that all users in the machine can able to use Eclipse. Having a launcher icon on the menu would be very handy to start the application right from the desktop. Go to Activities >> Search for Eclipse. On the first application launch, add Eclipse workspace directory and hit on Launch button to start the application. That’s all! The latest version of Eclipse IDE is now installed in your system. Also, you can get started with Eclipse by visiting the official Eclipse Documentation.